James Oliver Curwood was born in Owosso, Michigan on June 12, 1878. He was the son of James Morgan Curwood and Abigail Curwood. Curwood was an author, screen-writer and conservationist. Curwood attended Owosso's Central High School until tenth grade when he was expelled. He went on to attend University of Michigan for two years when he quit to become a reporter for the Detroit News-Tribune. Curwood wrote 33 novels during his lifetime. River's End was his first novel to sell more than 100,000 copies in its first edition. Most of Curwood's books were adventure tales set in the Canadian north country. Many of his books were picked up by motion picture companies and made into large motion pictures and many were also published in foreign languages. Only a few years ago, a motion picture, “The Bear,” based on Curwood’s book “The Grizzly King,” had its U.S. premier in Owosso. Curwood was an avid hunter until he had a near death experience with a bear. After his experience, Curwood began his mission to limit hunting seasons. On January 1st, 1927 Curwood was appointed to the Michigan Conservation Commission. In 1922, Curwood began the construction of a Norman chateau replica built on the banks of the Shiawassee River near his personal home. His writing desk sits facing the river. The exterior of the castle is made of yellow stucco with a slate roof. 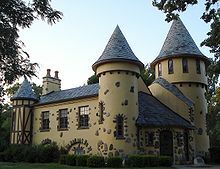 Many people believe that Curwood lived in the castle, but in fact there were no eating or sleeping areas in the castle. He used the great room to entertain guests including movie producers. Along with being successful in his career, Curwood was also successful in his personal life. In 1900 Curwood married Cora Leon Johnson. Together, they had two children, Carlotta and Viola. Unfortunately Curwood and Johnson did not stay married. Luckily for Curwood though, he married again - this time to Ethel Greenwood. Together had James Jr.
Curwood died at the age of 49 on August 13th, 1927. He was buried in Oak Hill Cemetery in Owosso.